"Dersu Uzala" occupies a central place in one of the most eventful chapters of Akira Kurosawa’s life. Following the lengthy production of 1965’s "Red Beard" and an ill-fated collaboration with Twentieth Century Fox that ended with him getting fired from "Tora! Tora! Tora!," he sought to venture into more artistically challenging territory and ended up making 1970’s "Dodes’ka-den," his first color film. A compassionate portrayal of downtrodden dreamers living in a slum outside of Tokyo, it was, sadly, a critical and commercial failure upon its release, adding to the depression that led to Kurosawa’s attempt on his own life in late 1971. But luckily, he did not succeed, and after properly recovering, he went about going back to work. With help from Yoichi Matsue, who served as an assistant director on "The Hidden Fortress" and producer on "Dodes’ka-den," Kurosawa was able to set up a co-production with the Soviet Union’s Mosfilm. The final result was "Dersu Uzala," an adaptation of Russian surveyor Vladimir Arsenyev’s autobiographical book detailing his experiences exploring and mapping the Usurii region of Eastern Siberia and friendship with the titular Goldi hunter he met there. The film marked a great rejuvenation for Kurosawa and won, among other awards, the Oscar for Best Foreign Language Film. After a short prologue in 1910, "Dersu Uzala" jumps back to the autumn of 1902, when Arsenyev (Yuri Solomin) first sets out with a band of soldiers on his topographical survey. Before long, the group has its first encounter with Dersu (Maksim Munzuk), who is initially mistaken for a bear when he emerges from the dark forest. An expert at hunting and surviving in the wilderness on his own, he joins the men and lends them his valuable skills. Arsenyev begins to form a close bond with Dersu, learning about how he lost his wife and two children to smallpox. The stumpy little Goldi imparts valuable lessons to the soldiers, like how it is proper to leave a stock of rice, salt, matches and dry firewood in an abandoned shelter for the next weary traveler to find. On one occasion, Arsenyev and Dersu become lost in a frozen wasteland and, following the hunter’s instructions, the two desperately work together to build a shelter before the freezing night claims them. After parting ways, they meet again years later in 1907, only to eventually realize that Dersu’s once-sharp eyesight is deteriorating. Yet despite the potential hazards this condition brings, he nonetheless ultimately decides that his right place is amongst nature. With "Dersu Uzala," Kurosawa returned to the grand, large-scale type of filmmaking he is so renowned for. After the constructed sets and artificial look of Dodes’ka-den, the director essentially did an about-face and supervised a lengthy location shoot in wild Siberia. Thus, the film’s visual splendor stems directly from the incredible imagery of the natural phenomena that reduce the humans who pass through it to miniscule figures. At several points, Kurosawa’s mastery of composition (here enhanced for the only time in his career by 70mm film stock) emerges in full force. One stunning shot shows the moon occupying the upper left corner of the frame, the sun the upper right, between them a tripod, Arsenyev and Dersu, all dwarfed by the vast sky and celestial bodies above them. Another strong image portrays the smoldering sun’s red rays reflected on the icy landscape. But Kurosawa is also at his very best as a storyteller here, and keeps the touching relationship between the two very different men at the forefront of the film’s priorities and, consequently, the audience’s awareness. The human element is never entirely overwhelmed by the imagery. 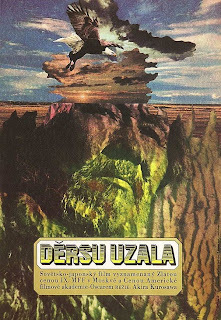 On top of these traits, there is the simple fact that "Dersu Uzala" is a highly entertaining adventure story. The survey team and Dersu must face all kinds of dangers, including Chinese bandits, tigers that pose both physical and spiritual threats and, of course, the various forces of nature that assail them. The men’s tremendous efforts to survive are made all the more vivid by Kurosawa’s gift for depicting the forces of wind and rain, water and earth. Admirers of the master’s previous work are likely to be reminded of similarly sensual imagery from such films as "Seven Samurai" and "Rashomon." One could see Dersu as a tragic mirror image of Kurosawa himself – especially in the film’s later half in which the hunter must accept the cruel effects of age (tellingly, Kurosawa himself became increasingly blind as he grew older). 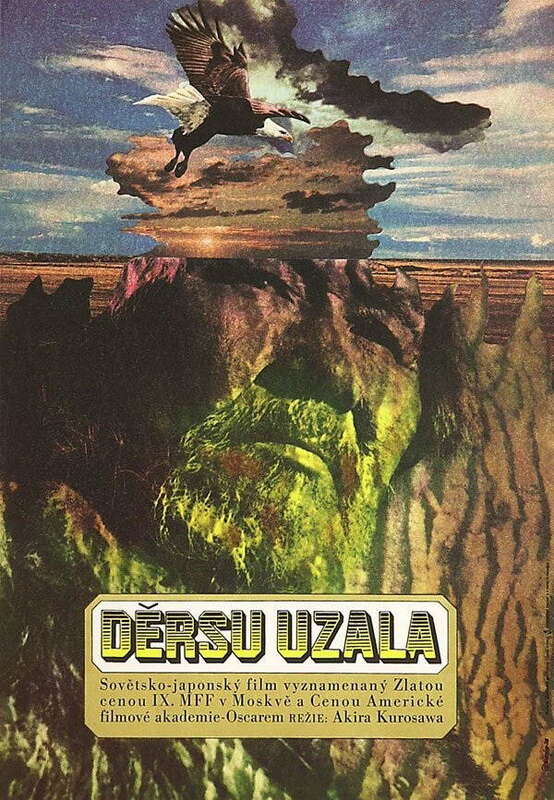 But on the other hand, "Dersu Uzala" represents a great triumph for the filmmaker, both on its own terms and in the context of his career. Even though Kurosawa still required outside assistance – from George Lucas and Francis Ford Coppola, no less – to get his next project, "Kagemusha" (1980), off the ground, that film went on to win the Palme d’Or at Cannes and cleared the way for the magnificent "Ran" (1985). 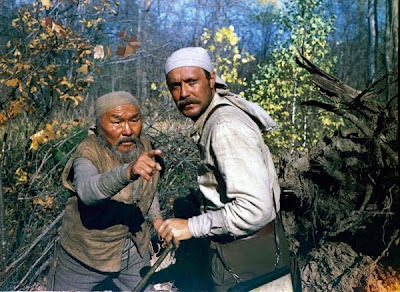 Indeed, "Dersu Uzala" is the central ingredient of a great comeback story and certainly does the trick in reaffirming the incredible talents of Akira Kurosawa.